Monkey Boy with his gift from his form teacher. 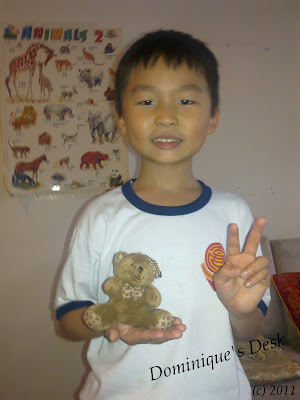 Six months ago I was asked by a reader on how to prepare her son for Primary One. Her son is currently 4 yrs old and would have to register for primary school in two years time. She was interested to know what were the requirements in terms of education level and syllabus which her son had to cover in order to be on par with his peers before he enters primary school. At that time I hesitated to answer her query. I wanted to give her a more detailed account with my first hand experience with Monkey Boy as he goes through the first semester as a Primary One student.